My feet are tingling with excitement to talk about today’s topic. I most commonly see this issue in patients with poorly controlled chronic diabetes, but many other diagnoses, such as vitamin deficiency can cause this too. If you have not guessed it yet, we are talking neuropathy today! The presence of peripheral neuropathy has been seen to be around 8 percent in patients over 55 years of age. However, if we look at those patients with Type 2 Diabetes, that percentage jumps up to 26.4 percent. When you have a patient come in to see you with complaints of tingling, numbness, or pain in the peripheral extremities the first step is to elucidate if these symptoms are caused by peripheral neuropathy or by a central nervous system disorder or lesion. Lesions in the peripheral nervous system are typically asymmetric, and the patient will have lower back or neck pain associated. In these cases, the neuropathic symptoms will follow the dermatomal path of which nerve root is irritated/compressed upon. The symptoms, however, can be symmetric which is more commonly seen in cases of diabetic neuropathy. Other things to complete on the physical examination include temperature, vibratory, proprioception, and pinprick testing. Loss of these sensation measurements in the distal extremities can be suggestive of peripheral neuropathy. 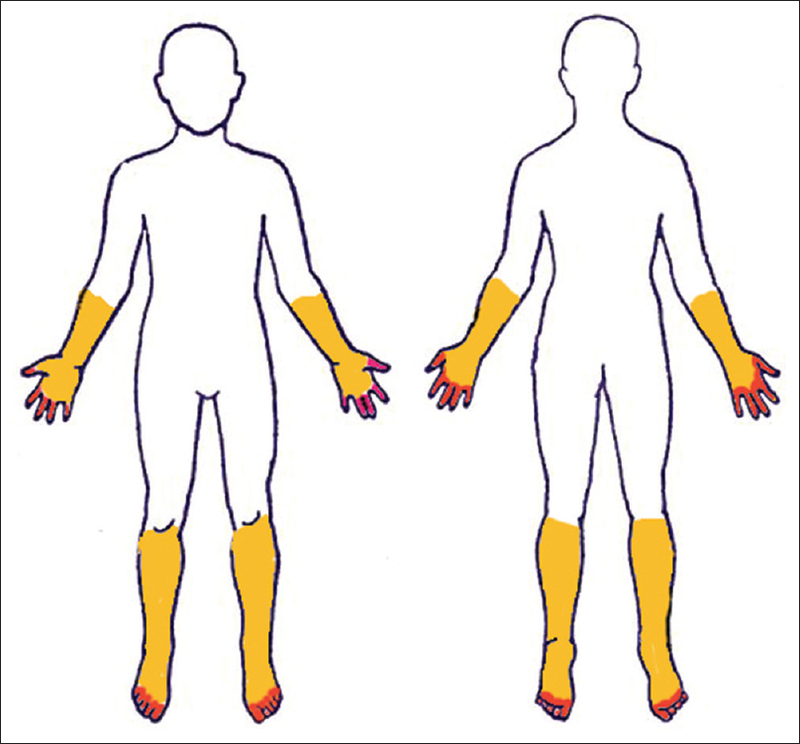 At the beginning of neuropathy cases, patients will often present with progressive sensory loss, pain, burning, or numbness in the distal extremities, and often will be in a “stocking and glove” distribution. 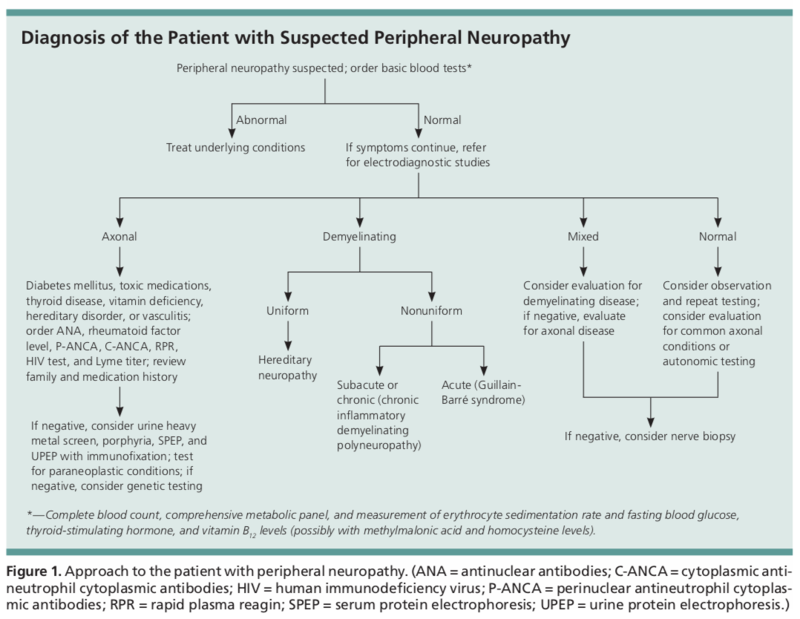 The initial diagnostic testing for patients with peripheral neuropathy includes basic blood testing with a CBC, CMP, ESR, TSH, A1c, and Vitamin B12. Other laboratory testing should be directed based on findings in the history and physical examination. These other tests might include an HIV screen, Lyme titers, rapid plasma reagin, urinalysis with a possible 24-hour collection to assess for heavy metal toxicity, urine or serum protein electrophoresis, ACE level, ANA, p-ANCA, and c-ANCA. 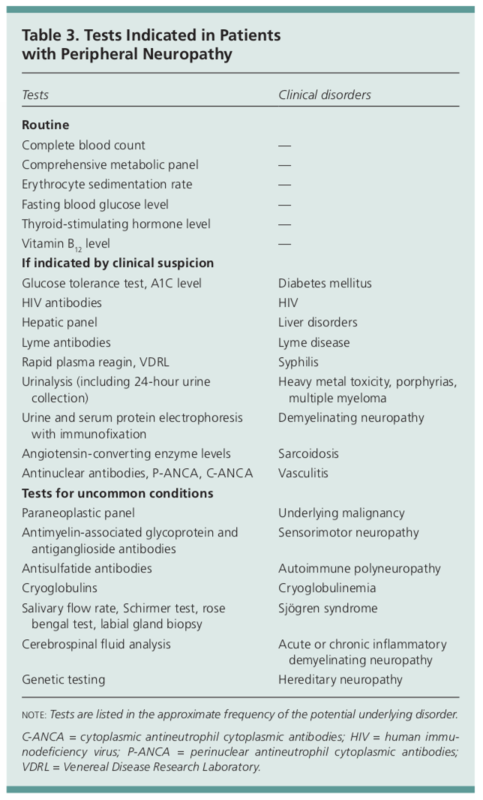 Tests for uncommon conditions include a paraneoplastic panel to assess for any underlying malignancy, antimyelin-associated glycoprotein and antiganglioside antibodies, antisulfatide antibodies, cryoglobulins, anti-Ro and La antibodies, CSF analysis, or genetic testing for hereditary neuropathies.1 The majority of these are often out of the scope that a primary care provider would test for, and neurologist expertise would be warranted. Electrodiagnostics are often indicated in cases of peripheral neuropathy, especially if the diagnosis is not apparent after initial testing. The two types of testing are nerve conduction studies (NCS) and electromyography (EMG). Electromyography can assess for active axonal damage, which is seen if there is the presence of spontaneous muscle fiber activity at rest, caused by the lack of neuroregulation.1 The action potential of the motor units are assessed as well on EMG studies. These tests aid in the determination of whether a neuropathy is due to damage to the axons, the myelin sheath, or both. Normal NCS and EMG results decrease the likelihood of peripheral neuropathy, whereas abnormal testing can aid in confirmation of the diagnosis. If the diagnosis remains inconclusive after laboratory and electrodiagnostic testing, a nerve biopsy can be considered. However, this would need to be completed by a trained neurology clinic or neurosurgery. 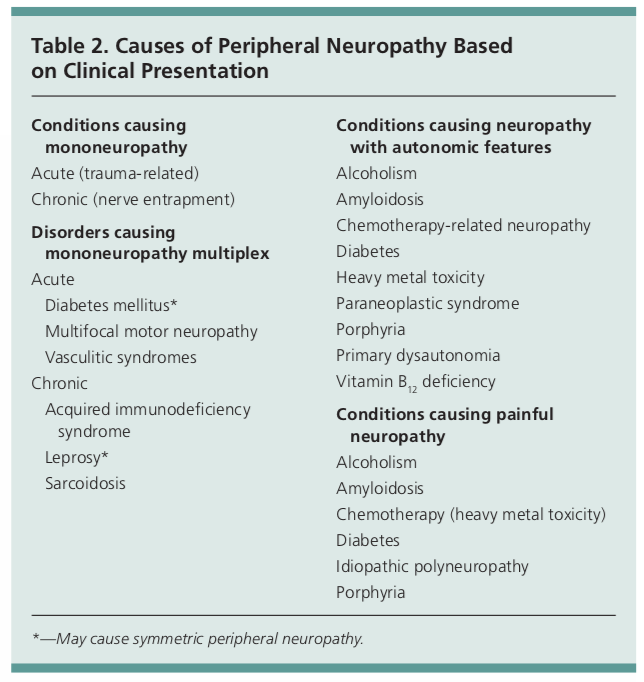 Treatment of peripheral neuropathy is split into two separate categories, managing the underlying disease causing the symptoms and treating the presenting symptoms themselves. Regarding the treatment of the underlying etiology, this is disease specific. It can be done by removing the causative toxins or medication. Additional treatments could include correcting a nutritional deficiency such as vitamin B12, thyroid hormone replacement, or lowering blood glucose levels in uncontrolled diabetic patients. In patients with acute inflammatory conditions, urgent treatment is required with intravenous corticosteroids or plasmapheresis. Additionally, mechanical ventilation may be indicated. Topical medications such as lidocaine and capsaicin may also bring relief. Other therapies include weight loss, foot care, special shoe selection, and physical therapy. Opioids can have a role in symptomatic treatment. However, patients should be evaluated for the risk of addiction or substance abuse before initiation. Narcotics should not be first-line therapy for neuropathy, and several non-narcotic medications should be trialed and failed prior. A second opinion from a neurologist should also be considered in these cases prior to initiating narcotic therapy. 1. Am Fam Physician. 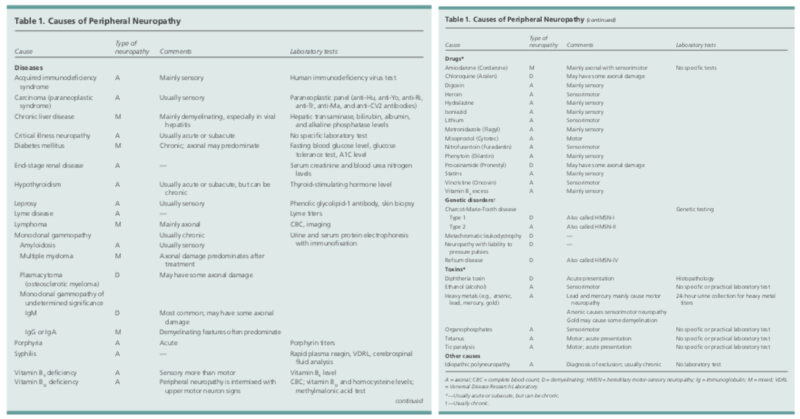 Peripheral Neuropathy: Differential Diagnosis and Treatment 2010;81(7):887-892. 2. 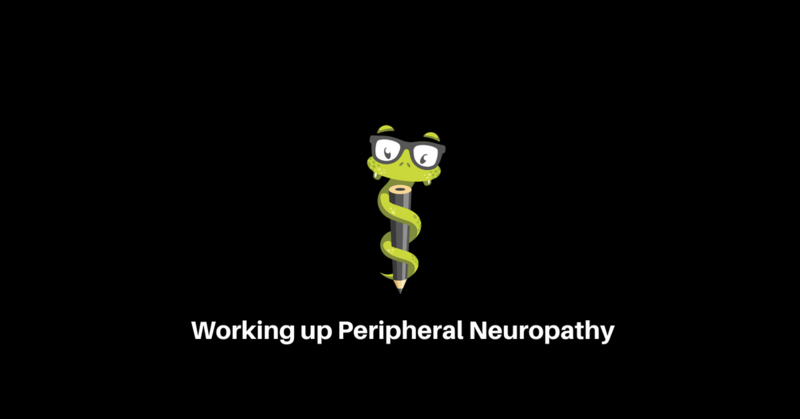 Ferri’s Clinical Advisor, Neuropathy. 2017. 3. Am Fan Physician. Treating Painful Diabetic Peripheral Neuropathy: An Update. 2016;94(3):227-234.